I’m really more of a stir-fry girl than fried rice… Indeed, I’m not typically drawn to things with the word “fried” in the description. My husband, however, loves anything fried and orders fried rice almost every time we go to an Asian restaurant of any sort. So I tried making fried rice at home, using the method in which the eggs are cracked into the pan and scrambled/ cooked into the vegetables, but I could never learn to like that texture. Finally, I read about a different method of cooking the eggs separately on Heidi’s site, and it revolutionized my fried rice! Once I learn a really good method of cooking something, it’s much easier to create recipe variations on the fly. To be completely honest, I don’t think I’ve ever made the same stir-fry or fried rice twice. Both of these can be made with almost whatever produce is on hand and can be made quickly- huge bonuses in this house! 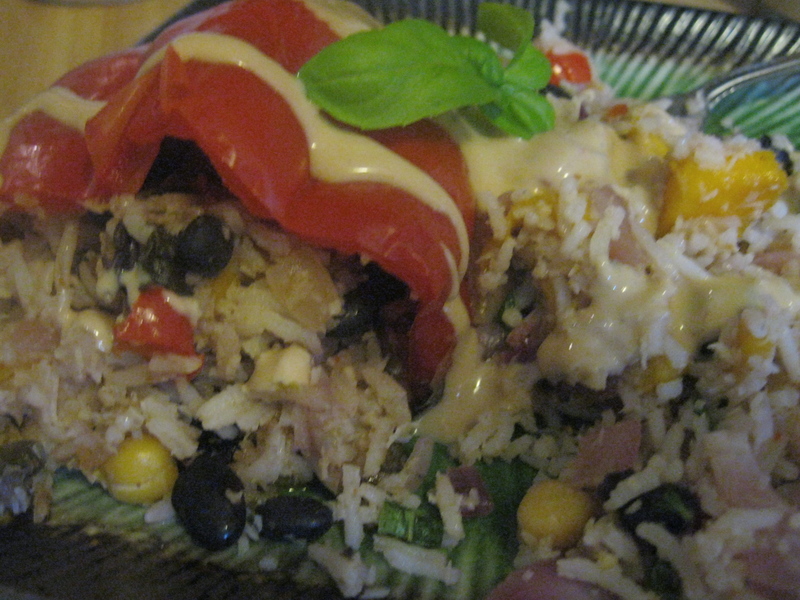 I have been making a lot of these types of dishes with our CSA goods. 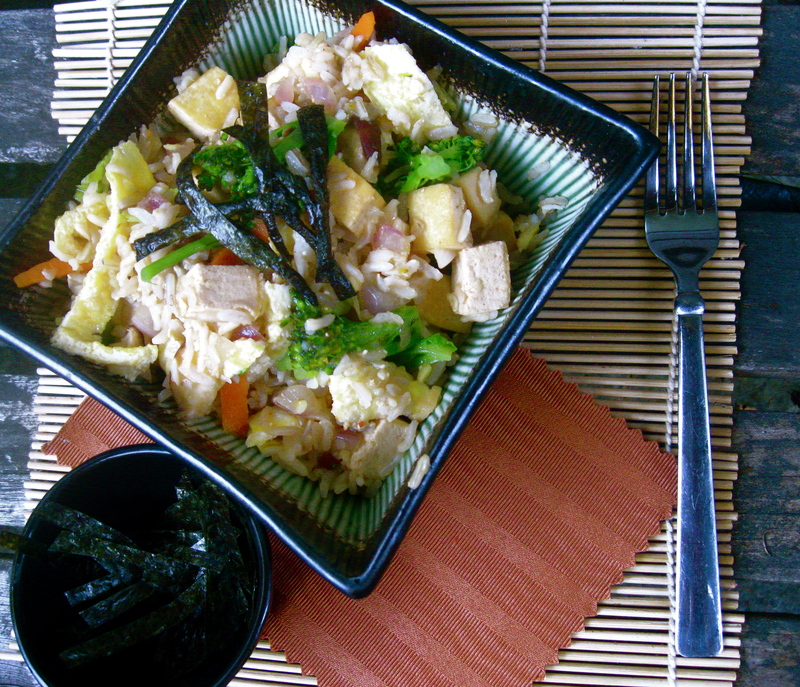 They also both rely on a method of cooking tofu that I adhere to for many dishes. Forgiving as this recipe is, there are a few things that I think really make it stand out: Besides the method of cooking the tofu and eggs, I like to use brown basmati rice- I buy it in bulk at Costco and am absolutely in love with it. It has the flavor and aroma of basmati, with the nutrition of brown rice. It is nice and fluffy, not sticky like some brown rice can be. I also like a combination of coconut and sesame oil for cooking. Coconut oil and sesame oil both have strong flavors and a little goes a long way. You can use another oil instead, I frequently do, but it doesn’t pack quite the same punch. Lastly, I add a bit of liquid such as broth or juice mixed with soy sauce at the end. The addition of the liquid reduces the amount of oil you will need to “fry” the rice. 1. Begin by making the sauce, combining orange juice, ginger, garlic, miso, 2-4 tablespoons soy sauce (depending on how salty you want it). You can use this sauce to braise the tofu as well, or you can use plain soy sauce. 2. Next, prepare the eggs: Heat 2 teaspoons sesame oil in your skillet or wok. Beat two eggs with a pinch of salt and pour into wok. Cook until almost set, then flip and cook a minute more. Cool and slice into strips. 3. Heat 2 teaspoons coconut oil in wok and add the onions, cooking a few minutes before adding the other vegetables. When the vegetables are tender-crisp, add the rice. Stir to mix evenly and cook until heated through. Add the tofu and egg, then pour the sauce in. Stir and cook until liquid is absorbed. 4. 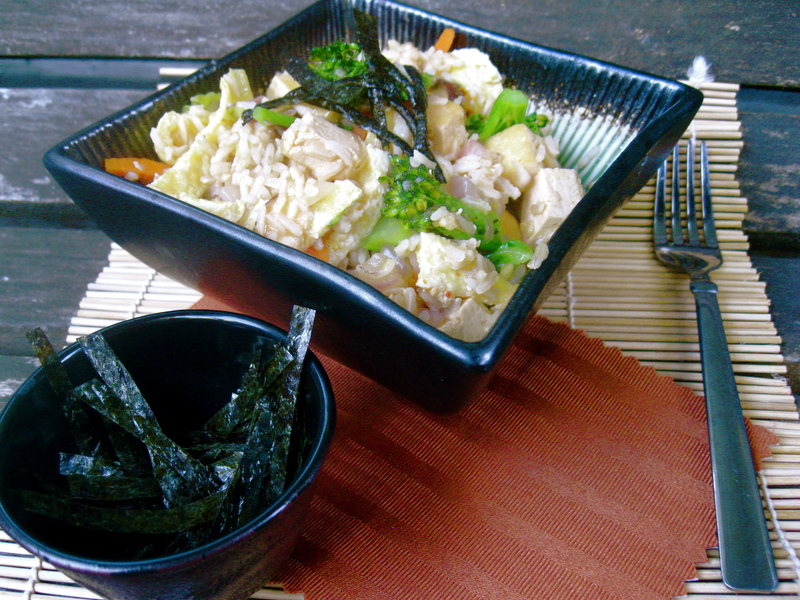 Serve hot, garnished with nori strips. 1. Begin with the right tofu. Buy the firmest regular tofu you can find. Extra Firm if you can find it. And don’t use silken tofu for this! 2. Press the tofu. Layer a few paper towels on a big plate, set the block of tofu on top, layer a few more paper towels, then another plate and finally something heavy like a text book to set on top of the plate. Leave for at least 30 minutes or overnight in the fridge. This will help remove excess water so that the tofu can absorb more flavor. 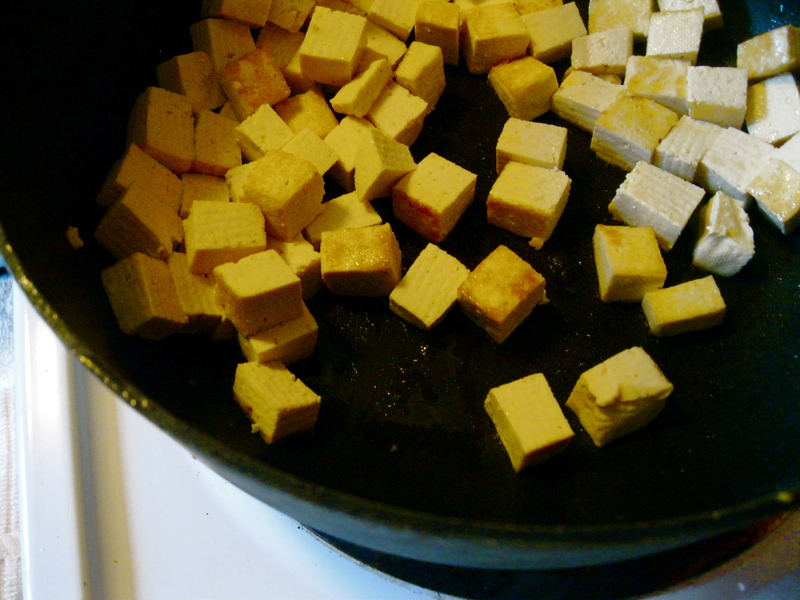 When the tofu has drained, cut it into 1/2 – 3/4 inch cubes. 3. Heat a little oil (2 teaspoons should be plenty) in a wok or large nonstick skillet. I really like to use coconut oil here for the flavor and the high heat properties , but you can use what you have on hand. Add the tofu and cook until golden brown on two or more sides, flipping the pieces after a few minutes to cook evenly. This should take about 8 minutes. 4. Now here is the important part: Prepare 2 tablespoons of soy sauce, with or without seasonings such as garlic, ginger, chile, or a hint of something sweet like agave or orange juice. Drizzle this into the pan with the crisped tofu, coating as evenly as possible and stir until all liquid is absorbed. I’m going to be working a long stretch starting tomorrow… I like to have either super simple or make ahead meals when I work long days. Any ideas for a make ahead or quick dinner? Look at them. They're begging to be stuffed. All nestled in the Crock Pot! I don’t make stuffed bell peppers very often because I don’t like green peppers and red ones are frequently about $1.50 each around here, which just seems silly. Last time I went to the store they were $0.68 though and I greedily grabbed 4, knowing exactly what their future would be. I may have accidentally melted the control part of my crock pot by having it too close to something cooking on the stove. Now it only sometimes turns on when I plug it in. 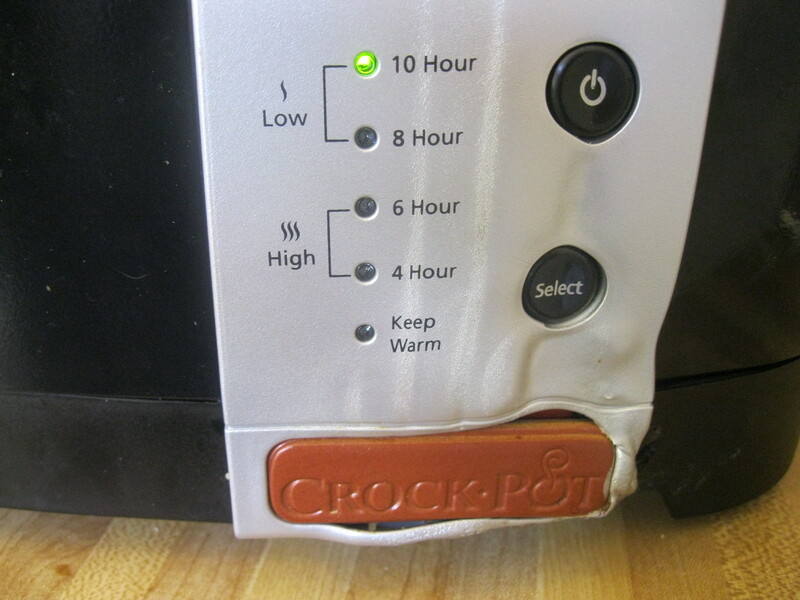 And when it does turn on it only works on one setting. The worst part? I had only had this for about a month when this happened: Andrew bought it for me to replace my old one, which I dropped and shattered the insert of. I’m accident prone, but I digress. Onto more cheerful topics, like Thai flavored stuffed peppers! This recipe is adapted lightly from an amazing cookbook called Fresh From the Vegetarian Slow Cooker by Robin Robertson. It is one of my favorites, full of simple and delicious things you can throw together in the morning and come home to dinner waiting for you. 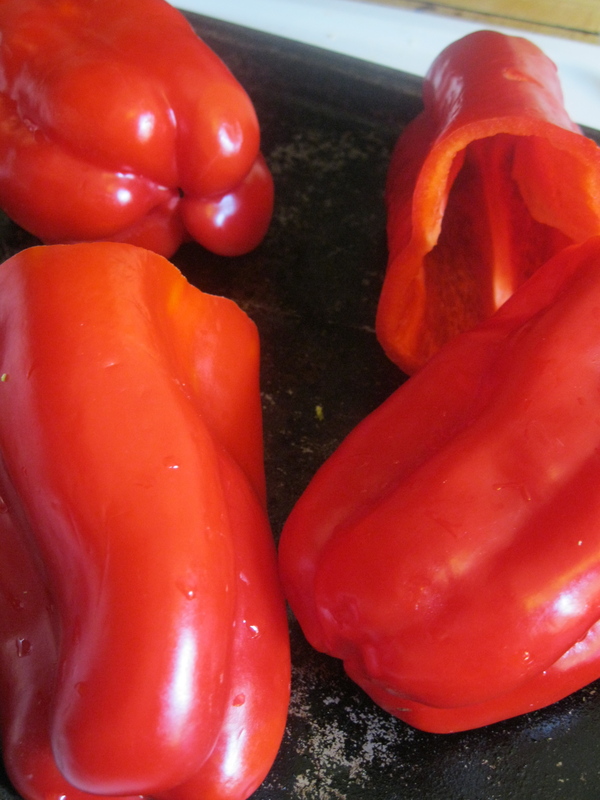 *4-6 large bell peppers (I prefer red, which are not only sweeter but also higher in vitamins A and C than green, but you can use whatever color you like), tops sliced off and diced, hollowed out. *1 large mango (use Manila or Champagne mangos if you can find them. They are much smoother in texture than regular mangos) —–> for the best way to chop a mango neatly, click here. *Optional: to give these an extra kick, add 1/2 to 1 minced chili pepper, 1/2 to 1 teaspoon hot chili powder such as cayenne, or 1-2 teaspoons Sriracha sauce. *1 tablespoon coconut or olive oil, plus extra for greasing the crock pot or pan. 1.Heat 1 Tbsp. 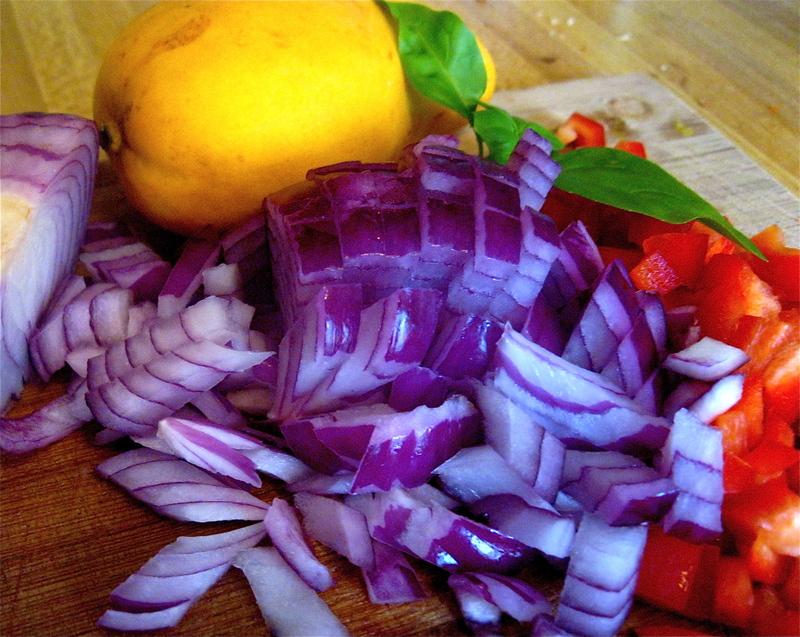 oil in a large skillet and add the onion and bell pepper. If you are using jalepenos, add them now. Cover and cook until softened, stirring occasionally, about 5 minutes. 2. 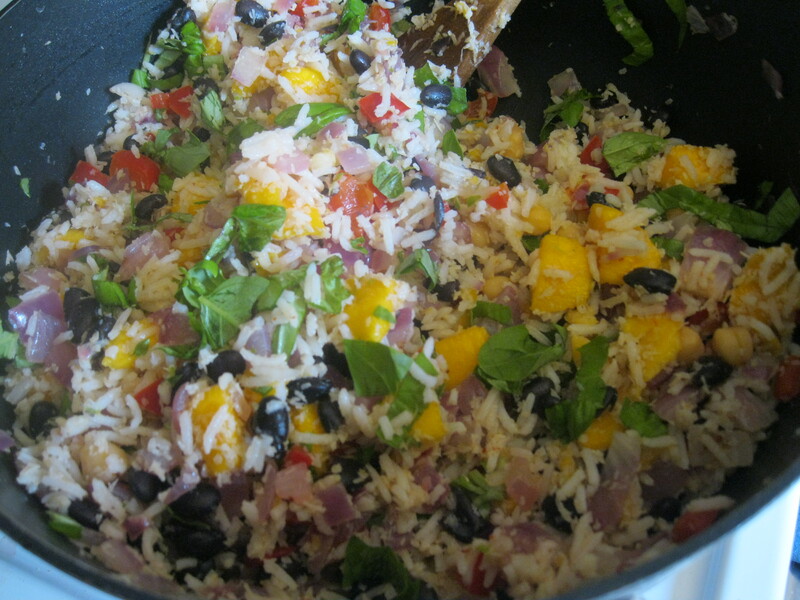 Remove skillet from heat and stir in the rice, coconut, beans, mango, half of the juice from the lime plus a bit of lime zest, agave, basil, and spice if using. 3. 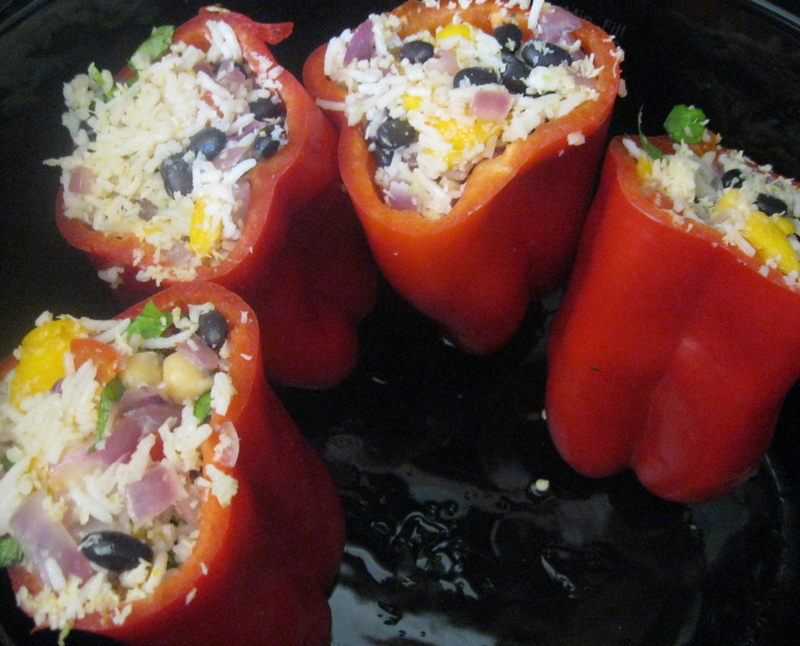 Spoon mixture into prepared peppers and arrange upright in a lightly oiled slow cooker. If you have extra rice you can serve it warmed with the peppers or reserve it for another use. Cover and cook on low for about 4 hours. I haven’t made these in the oven, but if you don’t own a slow cooker or are short on time, I would imagine they could be cooked at 350F for 45- 60 minutes. If anyone tries it, let me know!